In this new trailer, another land-based terror can be seen emerging out of the Earth and the shape is not telltale enough to say it’s of the established menagerie. There are pincers to some kind of land-crawler. The shape is wrong for it to be Gigan. Following the scene of Rodan coming out of a volcano is another ground creature which hints at Angiuirus even more. The next scene with a creature shows it encased in ice, but sadly not enough detail is offered other than its glowing blue eyes. The shape of Ghidorah is well defined to know that is not another shot of it which scientists are fearful of. The question of which of these creatures are here to protect us or finding Mothra in pupae form, and she will no doubt evolve into Battra form. The meteorite falling to Earth may well hide another monster. 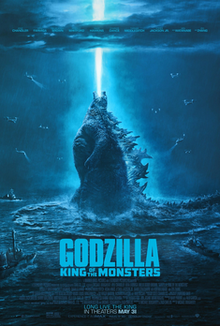 I expect Space Godzilla will make it to this trilogy even though studios have confirmed the third film will see King Kong into the foray. The showdown as revealed by the trailer is obvious. Godzilla is going to fight Ghidorah. The fight is going to be real, and the organization Monarch will have their hands full in trying to manage the damage to come. Their idea is to hopefully control one of the kaijus. Good luck with that!